An alphabetic San Ildefonso Pueblo artist list to help you find pottery and painting information quickly. A detailed photo gallery of pottery including Maria and Julian Martinez and their families work. The gallery of signatures is very important to the preservation of the pottery history. Please let us know if you have any signatures that we are missing or are not correctly identified. At the beginning of the 20th century, Maria Martinez led a pottery revolution at the San Ildefonso Pueblo in northern New Mexico. When disease and drought attacks the pueblo, Maria started a flourishing business in pottery and artwork sales to people who are coming West on the railroad started around 1880. This was a very important step in keeping the Native American San Ildefonso Pueblo alive. In the early 1910s Maria brought back some old techniques and started making pottery that was smaller and more sellable to tourists, with the help of her very talented husband Julian Martinez. 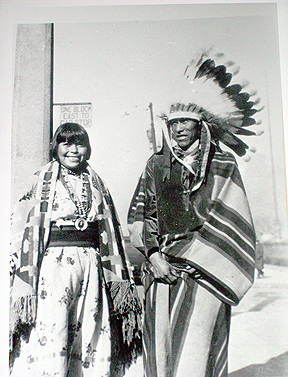 In 1904 both of them went to the Chicago world's fair and again in 1914 went to the San Diego world's fair which helped bring their artwork and pottery and also San Ildefonso Pueblo's works to national prominence. The next generations of potters included Maria and Julian son Popovi Da, grandson Tony Da and Russell Sanchez to name just a few. Other wonderful San Ildefonso Pueblo potters such as blue corn, Rose Gonzalez, Juanita Pena and many more added to the tradition of the art and pottery of the San Ildefonso Pueblo. 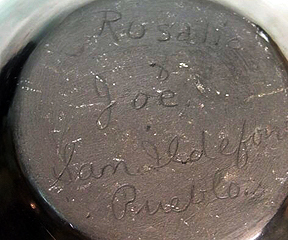 Around 1918 to 1919, Julian was brushing the designs on Maria's pots and he, for some unknown reason, brushed a design on a pot that was meant for black firing. Maria was annoyed at him because the design will not come out when you fire it as black. But they decided to fire it anyway. What came out was the brushed area was a grayish black which contrasted well with the rest of the black pot. Hence, the creation of black-on-black pottery that became the most popular style for the next 100 years!